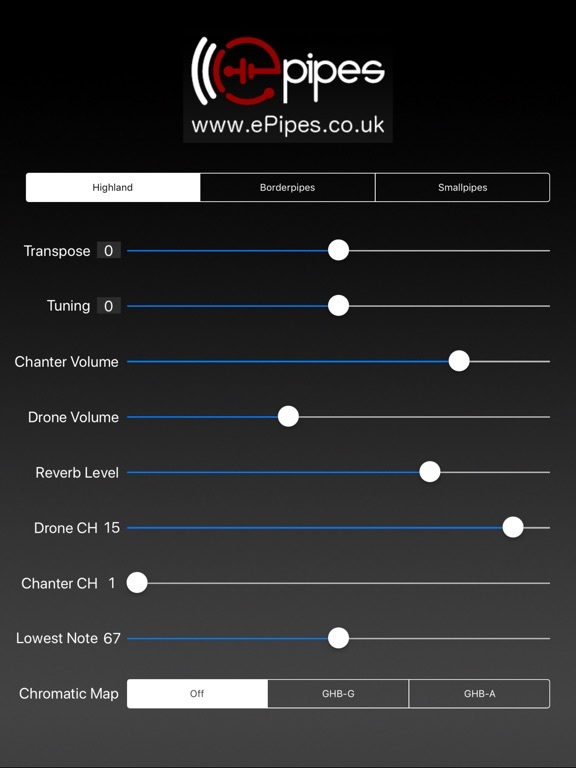 ePipes is a tunable, authentic sounding set of Scottish Highland, Border Pipes, and Smallpipes as a MIDI sound module that can be played using a hardware MIDI chanter like the Fagerström Technopipes. The app also works with hardware MIDI keyboards and MIDI file player apps with appropriate settings of the lowest chanter note and MIDI channels. Select the instrument style using the instrument selector. Available bagpipes styles are Highland, Border, and Smallpipes. The pitch may be transposed in semitone increments using the Transpose slider. 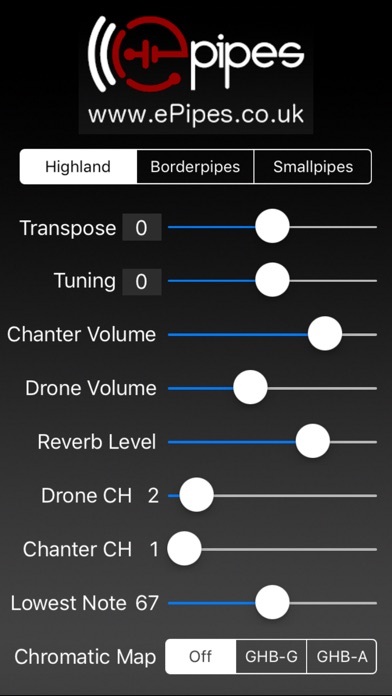 Set the volume of the drones and chanter individually using the Drone and Chanter Volume sliders. Use the Reverb Level to set the overall reverb level. Use the Lowest Note slider to set the MIDI note for the bottom note of the chanter. Range of the lowest MIDI note slider is from 55 to 79. The drones will start upon receiving any MIDI Note-On event with the note number less than 80. A MIDI Note-Off event with the same note number that started the drones on the drone channel will stop the drones. The app may also be played from a MIDI file player app using CoreMIDI or a hardware MIDI keyboard attached to the device using a MIDI interface connected to the Lightning port. You may need to adjust the lowest note offset to best work with your setup or MIDI files. Added support for landscape orientation on iPad.